The first ever contest allowing members of the public to name ExoWorlds begins its first round today, offering the registered clubs and non-profit organisations the chance to nominate their favourite systems to take through to the next rounds. As previously announced, the Interntional Astronomical Union (IAU) is organising a worldwide contest to give popular names to selected exoplanets along with their host stars, among a list of hundreds of well-characterised exoplanets it has offered for public naming. Today, the IAU officially opens this NameExoWorlds contest. The first round of the competition allows all registered clubs and non-profit organisations to nominate up to 20 ExoWorlds (exoplanetary systems and their host stars) to be made available for the next stage of the contest, where names can be proposed for the most popular ExoWorlds. Although people have been naming celestial objects for millennia, the IAU was delegated the task of assigning scientifically recognised names to newly discovered celestial bodies by its member countries. The NameExoWorlds contest is the first opportunity that the public will have to name not only exoplanets, but also, for the first time in centuries, to give popular names to stars — those that have known exoplanets in orbit around them. To participate in the contest, clubs and non-profit organisations must first register with the IAU Directory of World Astronomy. The deadline for which has been extended to 23:59 UTC on 15th May 2015 (12:59 am BST on 16th May 2015). The deadline for the first stage of the contest itself is at 23:59 UTC (11:59 pm GMT) on 15th February 2015, when nominations for 20 ExoWorlds to be named will close. In the next phase, once the most popular ExoWorlds have been identified, the stars and planets will be made available to all registered clubs and organisations to submit their desired names. Each club or organisation can then propose a name for one ExoWorld, with all submissions having to abide by the IAU Exoplanet Naming Conventions and be supported by a detailed argument for their choice. When this stage has concluded, the public worldwide will then be invited to vote on their favourite proposed names. The final results are expected to be announced at a special public ceremony held during the IAU XXIX General Assembly in Honolulu, USA, 3rd–14th August 2015. 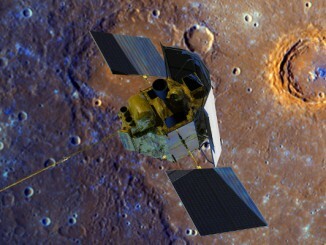 To celebrate MESSENGER’s highly successful ten-year mission, you’re invited to immortalise five famous artists, composers or writers by naming craters on Mercury in their honour — but hurry, the contest closes 15th January 2015! Astronomers using NASA’s Hubble Space Telescope have measured the rotation rate of an extreme exoplanet by observing the varied brightness in its atmosphere. 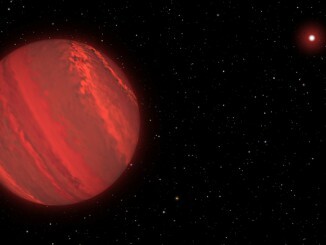 The planet, called 2M1207b, is about four times more massive than Jupiter and is dubbed a “super-Jupiter.” This is the first measurement of the rotation of a massive exoplanet using direct imaging. 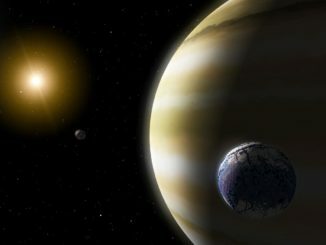 Strong hints have been found of a possible exomoon candidate orbiting a gas giant planet over 4,000 light years away in the constellation of Cygnus the Swan. Should the moon be confirmed later this year by the Hubble Space Telescope, it will be the first moon ever discovered around a planet beyond our Solar System.